Dec 22, 2016 (LBO) – Sri Lanka’s Central Bank effectively tightened its monetary stance on Thursday by conducting a repo auction at 7.47 percent, above the Standing Deposit Facility Rate (SDFR) of 7 percent. The repo auction for around seven billion rupees absorbed excess liquidity in the market, which may signal an upward tick in interest rates, dealers said. “There is withholding tax when you go to the repo window, which is not the case at this auction rate. This is effectively a tightening,” one dealer said. However, treasury bond rates in the domestic market dipped slightly on Thursday after the announcement of 57 billion rupees in auctions for 5-, 8-, and 10-year bonds on the 27th of December for 19 billion rupees each. The 10-year treasury bonds was steady at 12.60 percent. Around 124 billion rupees in bond maturities are expected in early January, and the Central Bank indicated that the entire amount will not be rolled over at a pre-bid auction meeting this week. With volatility in emerging markets and an outflow of dollars from the bond market, the Central Bank has been involved in a juggling act guarding both the rupee and interest rates. Dealers have noted foreign selling in domestic treasury bonds of around 50 billion rupees (337 million dollars) in the last three months. 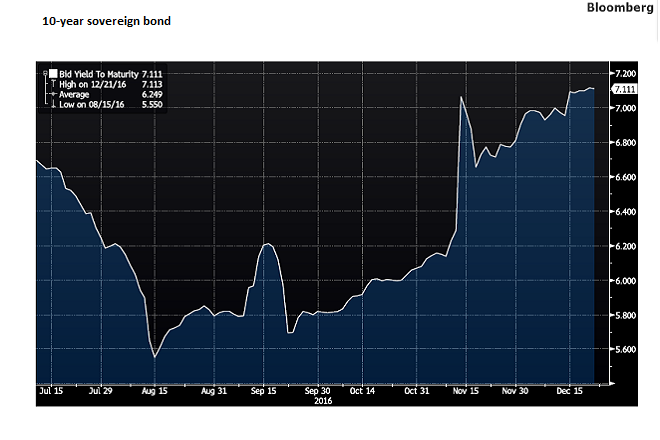 Similarly, the yield on Sri Lankan 10-year sovereign bonds rose to 7.11 percent on Thursday, up from 5.56 percent in August, reflecting capital outflows from emerging market bonds. Nevertheless, economists say a narrowing of the budget deficit, Chinese investment in key infrastructure of around a billion dollars and an IMF support program should stabilize the island’s economic outlook for next year. A strong tourism season too is supporting the island’s balance of payments, along with foreign remittances by workers abroad. The Sri Lankan rupee was trading at 150.70/150.90 against the dollar based on one-week forwards.